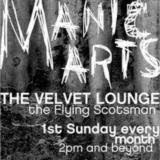 I decided to leave the shire on the weekend and make my way up to Manic Arts @ the Velvet Lounge / Flying Scotsman. There were some really cool artists there. I set up my trusty table outside and with the sun shinning down, beer in my belly and started painting some canvases. Thanks to all the crew at Manic Arts it was a fun arvo.